The library saw major increases in every area of use this year. We broke our all-time record for checkouts again, for the second year in a row. Last year we broke the 2013 record by 184 visits (1 %) and this year we broke last year’s record by 767 visits, a 6 % increase. In addition, we had 8,789 library visits, an increase of 10% over last year’s total, falling just 4 visits short of our all-time record from 2012. We had an 54% increase in programming over last year’s total, 35% increase in room use, 24 % increase in computer use, 32 % increase in interlibrary loans (for our patrons) and a 48 % increase in NH Downloadables. We continued regular programs like Friday Family Hour and monthly Morning & Evening Book Groups, and this year watched and discussed two movies based on books our groups read, The Immortal Life of Henrietta Lacks and The Glass Castle. We held our first “Meet the Candidates” night in March, and “Winter Warm-Up” in December, which we look forward to making annual events. During our Build a Better World summer reading program we hosted several speakers as well as a theatre performance on our lawn of Beauty and the Beast from Hampstead Stage Company. We showed the movie Lego Batman outside and hosted activities from the Mariposa Museum and the Boston Museum of Science. The Solar Eclipse program in August with UNH’s Dom Andreoli was another popular program, during which we handed out solar eclipse viewing glasses to all 60 attendees. Over the course of several months we handed out 1,000 pairs of glasses, to people from all over the state, and thanks to careful rationing in the few weeks before the eclipse we did not run out until a few hours before we closed before the eclipse. One of this year’s most moving programs was the first public viewing of the Home Movies of Louis de Rochemont, which led to a reunion of de Rochemont descendants from near and far, along with others interested in his rich historical ties to Newington. This year we also began providing monthly outreach programs for children of deployed family members at the 157th Air Refueling Wing at Pease Air National Guard, and also partnered with the Mall at Fox Run to coordinate a monthly story time hosted by children’s librarians from around the seacoast. We displayed quilts in the library from Newington quilters Luanne O’Reilly, Cathy Hazelton, Kathy Brown, Grace Simms and Jane Mazeau. Over the year we also enjoyed work loaned by Newington artists Dave Turbide, Grace Simms, the Newington Public School students in Youth Art Month, Micaela Klanchesser, and Heather Berry Belanger, as well as local artists James Monninger, Elise Sullivan, Peter Welch Claire Russo, Seacoast Open Studio, and the felt work of Kristen Weyrick Scott of FeltPals. Finally, we would like to acknowledge Wyatt Stone for being the first child in Newington to read 1,000 Books Before Kindergarten since we began the program in 2016. 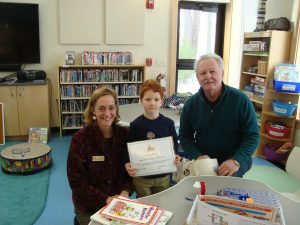 (Pictured above with Miss Amy and Library Trustee Chair Jack O’Reilly) Congratulations, Wyatt! If you have a pre-K child you would like to enroll in this program, ask Miss Amy at the library! This year we had 332 borrowers in total. Circulation of materials increased 6 % to 13,552 from 12,785. We circulated a total of 627 items through interlibrary loan this year—424 to other libraries, 203 to ours. Use of OverDrive, the NH Downloadables website patrons can use to check out eBooks and audiobooks using their library card, continued to climb this year—2,483 checkouts this year, after 1677 last year and 1455 in 2015. This year we added 1,394 items to the collection, and withdrew 440. At year-end we have a total of 21,202 items catalogued in our automated system, including 3,231 DVDs. We appreciate the recommendations our patrons give us and add most of them to the collection. This year we made repairs to the flashing on the old library roof. We also purchased four light posts to improve visibility on the library walkway during evening hours. Maldini Electric donated the electrical work on the posts, which we greatly appreciate! An abbreviated version of this summary appears in the Newington 2017 Annual Town Report, along with the library’s financial Summary of Accounts.